Its four stories and 17 storefronts were a “hive of business” occupied by grain merchants, steamship companies, and wholesale and retail houses, including the first offices of Marine Bank established in 1850. For decades, Thompson Bros. hardware was best known for its gold anvil, projecting from the eaves and swinging and glistening in the sun. 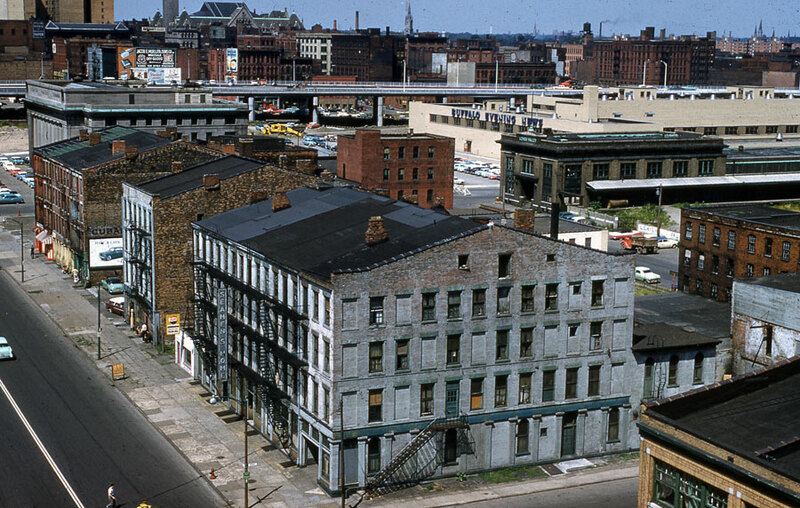 When this image was taken around 1958, the Webster Block was one of few survivors of Canal District slum clearance. The Seamen’s Home, a rooming house for sailors out of work for the winter, was still operating and would remain so until 1963. The Webster Block was razed by the Buffalo Urban Renewal Agency in 1969 to expand parking at Memorial Auditorium.